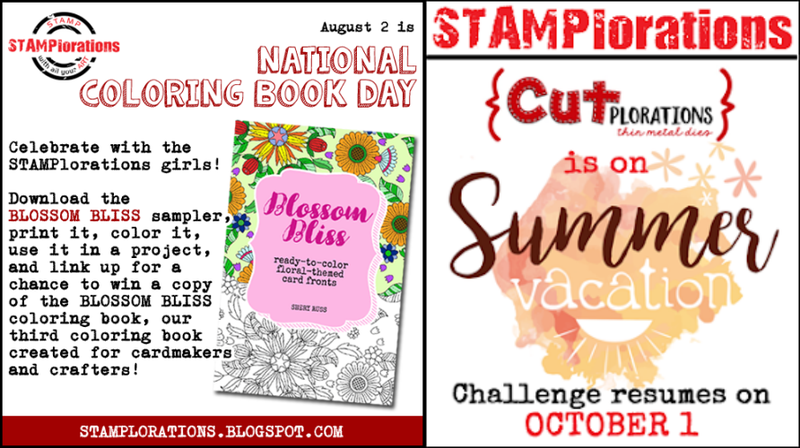 Today's card features a ready-to-color card front page for National Coloring Book Day. 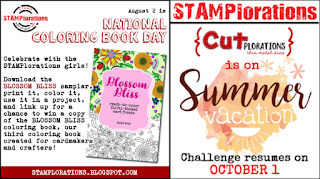 Stamplorations is having a special link party to celebrate so be sure to stop by their blog and check it out! I printed the page on watercolor paper and colored it in blues and greens using Prismacolor pencils. I used the Stamplorations Lower Case Alphabet Plate Die to add a bold sentiment across the bottom. Oh wow, this is just beautiful, Esther! What beautiful colors you used. awesome coloring job, Esther! i love the different shades of blue on the flowers! so glad you joined us for some coloring fun over at STAMPlorations! Esther, this is one beautiful and sweet card for a friend using the Blossom Bloss page. I love yout cool color combo on the background. Love it!!! The blues and greens are beautiful, gorgeous card! Lovely Esther! Those blues and greens are so refreshing. Thanks for joining CUTplorations.